Most snakes in America are not venomous. In fact, you are much more likely to stumble upon a non venomous snake than one that is. However, should you be bitten by a venomous snake, common sense snake bite treatment is crucial to survival. Do you have a snake bite kit? If you do, take the kit and put it in the garbage can, they are useless. 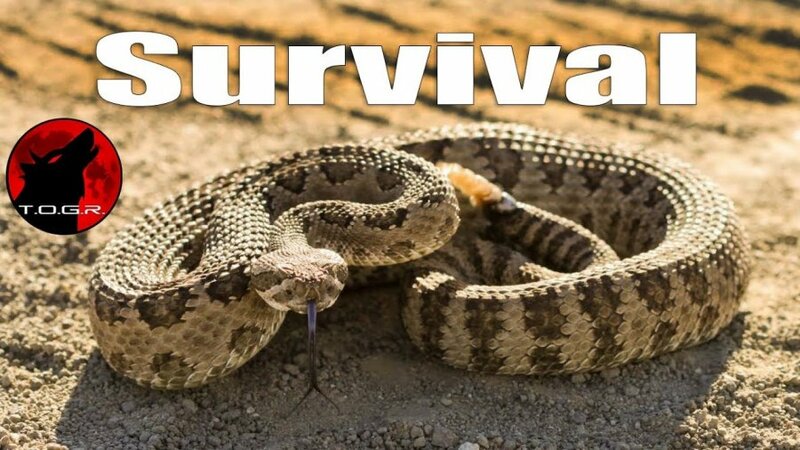 Sadly, the facts are that if you are envenomed by a large rattlesnake, and you cannot reach a hospital for antivenom snake bite treatment, you will most likely die. The bite from a large rattlesnake is fatal around 30% of the time WITH antivenom snake bite treatment. Without treatment, those percentages go up to around 90%. If possible, take these steps as snake bite treatment. Try to remember its color and shape so that you can describe it, which will help in your treatment. If you have cell phone, call 911. If you do not, try to remember the last time you did and make your way there. Clean the wound, if you have antiseptic wipes and simply cover it with a clean, dry dressing. Take notes, on your skin (so doctors can read if you are unconscious) noting the time bit, size and type of snake. Don’t use a tourniquet or apply ice. Do not use a snake bite kit, they are useless at best, and most times detrimental. Don’t drink caffeine or alcohol, which could speed your body’s absorption of venom. Water moccasins’ mouths have a white, cottony lining. Coral snakes have red, yellow and black rings along the length of their bodies. Their heads aren’t triangular and the pupils are round. Also known as the water moccasin or water pitviper, the cottonmouth is the only semiaquatic viper in the world. This snake is a strong swimmer and can be found commonly across the Southeastern United States. It has been reported to be ocean-going as well, colonizing remote islands in the Gulf of Mexico. The cottonmouth is one of the most feared venomous snakes in North America. Its powerful cytotoxic venom is so destructive that it can eat away flesh and result in grisly amputations. Their preference for hiding in water and attacking when least expected means that bites are also relatively frequent. Thankfully, modern CroFab antivenom keeps fatalities very low. In fact, cottonmouth venom is one of the main components of the treatment, along with venom from diamondback and Mojave rattlesnakes. Timber rattlesnakes are dangerous on all fronts. They are large, have long fangs, and sport potent venom, which they can pump an alarming amount of into their prey at any one time. Thankfully for us though, they are also known for their mild temperament and characteristic rattle. Timber rattlesnakes are among the most patient of their kind and will often give lengthy warnings before attacking. Due to this, few fatalities have ever been reported. This dangerous rattlesnake boasts no fewer than seven different subspecies, some of which have the notable distinction of having a highly toxic venom that attacks nerve endings, requiring a much higher dose of antivenom to treat. They can be found widely across the western half of North America, from British Columbia to northern Mexico. The tiger rattlesnake earned its fearsome name not for its behavior, but simply because of its pattern of vertical stripes. It also has the smallest head of any rattlesnake, but don’t let that fool you. This pit viper has an incredibly potent venom that by toxicity, is considered the most dangerous of all snakes in the Western Hemisphere. However, its small venom yield means that that there are much more dangerous snakes on this list. The tiger only lives in a small area near the Arizona-Mexico border and few bites have been documented. The small amount of venom it injects per bite also means that fatalities are very rare. The copperhead is perhaps responsible for the most bites of any snake on this list. It’s not because the snake is inherently more aggressive, but because copperheads tend to “freeze” when met with approaching humans—instead of fleeing like most other, sensible snakes—and will bite when stepped on. The copperhead also has what is believed to be the weakest venom potency of all pit vipers, which is a happy coincidence for the snake that is otherwise most likely to bite you. Eastern coral snakes are very reclusive and are rarely seen, which is great for hunters and hikers across the American Southeast. Eastern coral snakes were once seen as THE deadliest snakes in the region. While that reputation hasn’t exactly subsided, experts now say that fatalities from this dangerous species are actually very rare. This is thought to be because the coral snake has very little control of how much venom it can inject into a victim. At any one time, a coral snake can hold enough venom to kill five people, yet in most defensive bites it only injects a minuscule amount. Still, a large enough dose can kill as early as within two hours, making this snake one of the deadliest on this list. This snake’s method of venom delivery is perhaps the opposite of the tiger rattlesnake. The western diamondback has a relatively weak venom, but it can pump it out in high quantities, making it incredibly deadly. General symptoms include pain, heavy internal bleeding, swelling, muscle damage, and necrosis. It is also single-handedly responsible for the most snake-related fatalities in Mexico, and only lost to its eastern cousin in the number of US deaths. Indiana Jones may be the world’s most famous fictional archaeologist, but he’ll scream like a schoolgirl if he ever meets one of these. The eastern diamondback is the largest of all North American most venomous snakes, and it is arguably the most deadly. It has the largest fangs of any rattlesnake species in the world, a very high venom yield, and an absolutely devastating potency. The venom is so powerful, it can induce bleeding from the mouth and from the wound site. A bite from this snake has a mortality rate as high as 30 percent. Compared to the two species that came before it and the one next up on this list, the prairie rattlesnake is practically harmless. Well, maybe not, but this rattlesnake is still responsible for far less deaths than its diamondback cousins. It can be found across the Western United States, southwestern Canada, and northern Mexico. Its venom contains potent neurotoxins as well. If you gauge deadliness by venom, this is one of the big boys. The venom of a Mojave rattlesnake is widely considered the most potent of all rattlesnakes, even surpassing that of the tiger rattlesnake. The bite does not at first appear to be especially worrying, due to delayed symptoms, but victims can eventually experience blurred vision and respiratory failure. Their venom is veritable cocktail of destructive enzymes and proteins designed to kill prey, which led to the Mojave rattlesnake’s now legendary reputation.